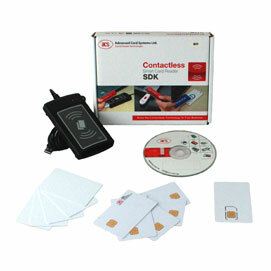 The ACR1281 USB SDK from ACS is an in depth development package combining both contact and contactless technologies. The kit contains a mix of contact and contactless smartcards, the ACR1281 dual interface reader from ACS and a wealth of development tools including demo programs, utilities and sample codes written in several programming languages providing users with a cost effective development solution. The ACR1281 dual interface USB smartcard reader from ACS is the second generation of the ACR128 reader featuring improved performance and firmware upgradability. The ACR1281 reader is a dual interface USB PC-linked reader and is compliant to ISO 7816 for contact cards and ISO 14443 for contactless cards. The dual interface feature economically supports end-user environments where both contactless and contact smartcard technology may be in use. To ensure security within your applications the ACR128 has a built-in SAM card slot, for which an ACOS6 SAM card is supplied. Demo programs ACR128 Multi-Application demo - shows a real world business application.